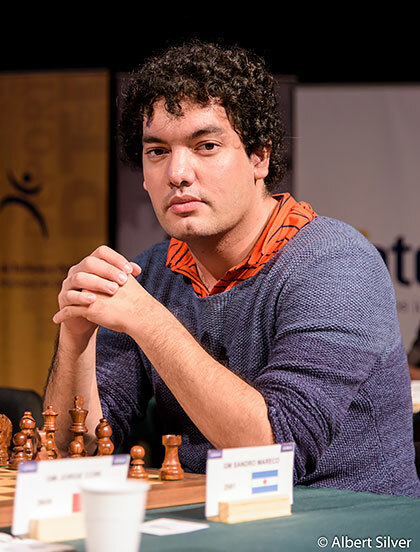 GM Ernesto Inarkiev won the Sharjah Masters 2019 with 7.0/9 and a performance of 2790. It was a seven-way tie at the top, but Inarkiev edged out everyone else with a superior tiebreak (Buchholz), and the prize money was not shared. Although Inarkiev was one of five leaders after three rounds, he was the only one of that group to finish at the top by the tournament's end. Wang Hao was the only one of the 2700-rated players to reach 7 points. I caught up with Inarkiev after the tournament and asked him about the last round exciting draw against Matlakov, his favourite game of the event, how he found the conditions in Sharjah, his views on Russia winning the World Team Championships, Kramnik's retirement and the upcoming talents of Indian chess. "In every tournament Russia is favourite, but it's not enough"
Inarkiev's two most important wins were against Indian players — Nihal Sarin in round four and Abhijeet Gupta in round six. In both the games you can see that the Classical variation of the Sicilian was played. Inarkiev's play had a nice blend of good opening preparation and logical moves one after another. He didn't make a mistake which would swing the evaluation in favour of his opponent. Both Nihal and Abhijeet were not able to keep the same amount of control. We have quite a lot to learn from Ernesto's handling of the Sicilian. After the start of 1½/3 Maxim Matlakov would not have thought that he would tie for the first place at the end of the tournament. He lost to Oliver Dimakiling and then drew against Sri Sai Baswanth (rated 2018). But not losing his faith Matlakov scored 5½ points in the last six rounds. Alireza Firouzja had another fine tournament. He remained unbeaten, scored 7.0/9 for an Elo performance of 2698. His live rating is now 2675. And mind you, Alireza is still just 15 years old! IM Lawrence Trent analyzed Firouzja's win over IM Anh Khoi Nguyen in the latest edition of The Weekly Show. IM Nodirbek Yakkuboev is still an IM, but easily surpassed the requirements of a GM norm with a 2689 performance, including two critical wins against Le Quang Liem and Vladimir Fedoseev. You'll find more clips via ChessBase India's Sharjah Masters 2019 playlist on YouTube. 4/2/2019 – IM Lawrence Trent brings you the latest trends, games and combinations from elite chess tournaments every Tuesday at 16:00 UTC (18:00 CEST, 12 Noon EDT). This week he looks at a game from the Sharjah Masters and discusses the finale of the U.S. Championship. Free to watch on-demand for a limited time with a ChessBase Basic Account. You can <a href="https://account.chessbase.com/en/create-account" target="_blank">register a free 90-day account</a> to watch.